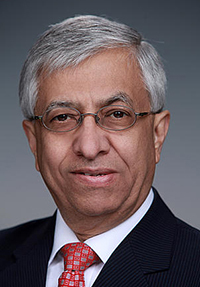 Congratulations to Dr. Ghassem R. Asrar, scientist at Pacific Northwest National Laboratory (PNNL) and director of the Joint Global Change Research Institute (JGCRI), on being selected chair of the international European Research Area for Climate Services (ERA4CS) Expert Panel. The JGCRI is a partnership between PNNL and the University of Maryland. The ERA4CS consists of 18 European countries aiming to provide science-based knowledge and information to confront impacts of climate variability and change in Europe, as well as guidance both to researchers and decision-makers in policy and business decisions. As the Chair, Asrar will facilitate discussion and decisions by the panel made up of 20 experts in various disciplines to reach consensus on proposals to be funded by the consortium. Asrar was selected to lead this panel based on his world-renowned experience and knowledge in Earth systems science, climate change and remote sensing. His background in the fundamental understanding of the connections between human activities and Earth's land, oceans, ice, and atmosphere will provide invaluable insight for the panel's deliberations. Prior to Asrar's position at PNNL, he was the Director of the World Climate Research Program in Geneva, Switzerland, from 2008-2013. He has a master's degree in civil engineering and soil biophysics, and a Ph.D. in environmental physics from Michigan State University.